If you have embarked on a bathroom remodelling journey, you need to have a clear idea of what your priorities are. Think about what the feature you missed the most was. Maybe it’s a fabulous curved bath, or a two-person shower? Perhaps it’s a music feature or a vintage vanity? Here are five ideas that might spark your imagination. All reports, surveys and preference studies aside, you are either a bath person or a shower person. 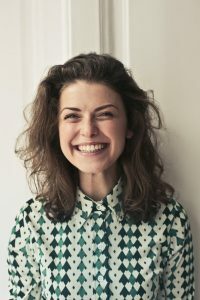 Manufacturers are following the customers’ affinities as hi-tech spa body sprays, water jets and massage showerheads are becoming more common, even in the mid-budget range. Once reserved only for top credit buyers, fully enclosed steam showers with multiple showerheads are a type of luxury that is now standard in many new homes and remodelled master bathrooms. 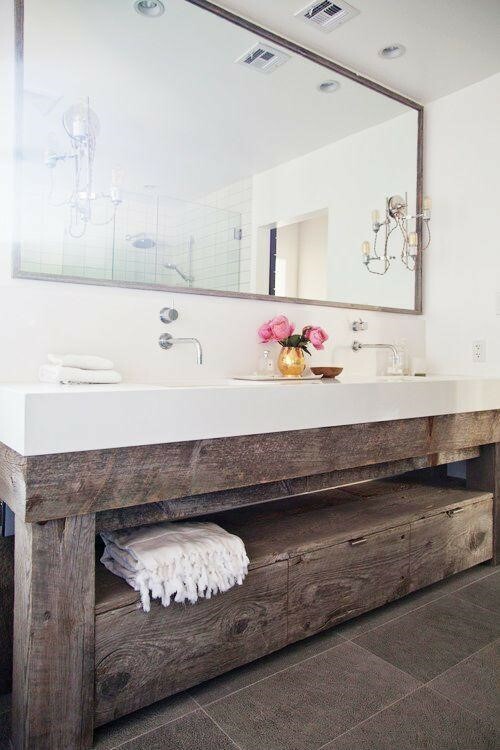 A portable bench is always a welcome luxury add-on to your walk-in shower that doesn’t have to break the bank. When remodelling a bathroom, many homeowners opt for fixtures like no-threshold showers, comfort-height toilets and side mounted faucets that increase the comfort of their most private moments. Curb-less showers are ideal for smaller bathrooms, because not only are they easier to clean, but also make the space look bigger. The design of these fixtures can significantly improve the look of the bathroom, and their ease of accessibility is sure to increase the home’s resale value. Floating vanities are a popular trend these days, as they offer virtually unlimited customization options. In fact, they are easily taken for a stylish piece of art rather than a bathroom fixture. For a skilled interior decorator, the bathroom is the perfect playground to test daring design choices. A set of unusual sconces on both sides of a mirror won’t go unnoticed, but will also help you get ready in the morning. Maybe even inspire your choice of outfit. An ornate chandelier can really lift a period bathroom to a higher level of style. Illuminate your beautiful vanity from both above and below, to put it in the spotlight. Who says a pair of table lamps doesn’t belong in the bathroom? Have you given it a chance? You can always take them back to the living room if you are not impressed. Once considered not only inappropriate, but also inadvisable, electronics are making a big entrance into the bathroom. Wireless speakers, Bluetooth devices and docking stations are designed to be bathroom-friendly and readily incorporated into bathroom mirrors, showerheads and vanities. Manufacturers like Kohler even went one step ahead, by designing a showerhead and speaker combo. Who can say now that multitasking in the bathroom isn’t possible? Why wouldn’t you double the relaxation by soaking in a warm bath and binge-watching your favourite show? Place a TV on a strategic spot on the wall and catch up with the latest news and weather as you are getting ready for the day. It is often said that every bathtub type has a personality to match. While freestanding and clawfoot tubs boldly occupy a central position in the bathroom, alcove, drop-in and corner tubs are safely nestled against the wall and integrated into the overall setting. Alcove tubs are great for maximizing the space, as their unfinished ends are usually sandwiched between the exterior wall and a built in storage space. 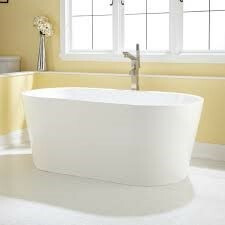 Drop-in tubs, on the other hand, are for people who don’t want anything to overshadow their bathroom décor. They are fitted inside a framed enclosure with a finish to match bathroom cabinets or tiles. Finally, nothing can match the elegance and charm of a freestanding stone bath as a bathroom centrepiece. Sculpted in many modern shapes, these baths provide much more than just functionality. Whether you are looking to increase your comfort or improve the visual appeal of your old bathroom, with the abundance of affordable options we have today, there is virtually no limit to what you can do.